"My fellow monsters," said Moreau. "No longer will we hide in the shadows, cringing, cowardly, hiding our true potential. You see, the humans do not view us as people. We must force them to expand their view of personhood to include us. By any means necessary." A year ago, Boy, the son of Frankenstein's monster, had never even met a human. Now he's living with his human 'family', the descendants of Dr Frankenstein, in Switzerland. That is, until the maniacal genius Dr Moreau, long ago banished to a remote island for his crimes against humanity, asks for his aid. The son of Frankenstein's monster is off on his first adventure into the world, Boy having spent most of his life hidden within the shadows of the New York theater company which hides the worlds monsters. But now he finds himself in Switzerland, his host family none other than the descendants of his fathers maker and wants nothing more than to assimilate and study, leaving behind the only life he's ever known. Boy wants nothing more than to merge the community of underground monsters with our world, but the diabolical Dr Moreau believes the only way two worlds will transition into one is to forge a war against the humans, creating a legion of monsters to fight against a world he sees as cruel and unjust. But Dr Moreau isn't working alone. An old enemy will resurface as Boy returns to find his beloved New York home in ruins. With a war being forged, how will the little patchwork monster fight for the humans who are unaware his community exists? Man Made Boy was one the loveliest storylines I had the privilege of enjoying almost two years ago, hoping for a sequel that was rumoured but never came to fruition... Until now. I adore the little patchwork monster simply known as Boy. He's intelligent and although made of a series of body parts from the dead, his crude stitching and gentle nature completely enchant me. And This Broken Wondrous World is no different. At the end of Man Made Boy, Boy is contemplating seeing the world and traveling to Switzerland to stay with the Frankenstein family, descendants of the man who had created his father. Loving and accepting, is isn't long until Boy is treated as family and is befriended by his cousin Henri. The only rule is that he not tell the Frankenstein's about the New York community, the humans still unaware of the network of monsters who live among them. But when an old foe lures them into what seems to be a trap, Boy has no option to involve Henri and deal with the consequences later. When Boy needs them most, old friends come to his aide. Claire Hyde and Sophie Jekyll, the granddaughters of the Jekyll and Hyde are back, Boy needing his girlfriends by his side as he faces the prospect of war. The Trowe will return as does a gruff shapeshifting wolf, as monsters will be forced to choose to support Boy in his plight or to fight for Dr Moreau and his band of newly formed monster army. Although superbly entertaining, This Broken Wondrous World lacked the emotion of Man Made Boy, with Boy having lost his naivety which I found incredibly endearing. 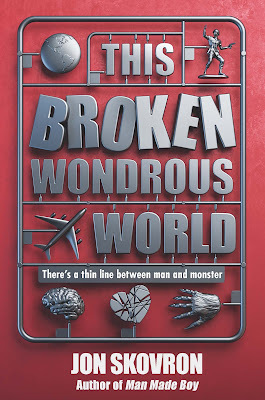 Despite not feeling an emotional connection, I thoroughly enjoyed This Broken Wondrous World. Wonderfully written, it's ultimately the story of acceptance and making the most of the hand that life has dealt. I'm completely smitten with the little patchwork monster. Thanks for sharing! Sorry there wasn't a big emotional connection, but that's good you could still enjoy the sequel overall. Thanks Lauren. I loved the first book and enjoyed the sequel, but sadly it just didn't hold that same magic. Less monster and more teen boy with hormones trying to save the world. I didn't read the first one but this one sounds like a really love sequel that follows the adventures of Boy. Too bad about the emotional connection though Kelly! The first installment is much better Jeann, really lovely actually with Boy exploring the world. This felt more so typical teen male protagonist, rather than the patchwork monster from Man Made Boy. I still enjoyed it though. I sometimes struggle with books if I'm not emotionally connected to the story, but this series sounds too wonderful to pass up. I love that you're always reviewing these books that I've never heard of. But at the same time, I have a bone to pick with you since my TBR pile keeps getting out of control!! It was a great read, but I just didn't fall in love with it the way I did with Man Made Boy, which was glorious! Definitely give book one a try, I can almost guarantee that you'll adore it too Nick. How very brilliant to interweave the origins of Frankenstein and Jekyll and Hyde into a narrative, but with a twist here and there ;) and just in time for October too! Also, I'm with everyone here, if I simply cannot find a connection with the prose I am investing time in, it will more than likely receive a low rating, but I'm glad you were able to find some other aspects that drew you to give This Broken Wonderous World four stars! I liked it, but not loved it Claudia. I think I was a bit disappointed especially because I loved book one so passionately. I'm still stuck on the fact that it took 2 years for this book to come out! I'm all about the wait for a book and once waited almost 7 years for one so I feel your pain! I FEELLLL IT GIRL. This does sound like a very lovely and enchanting story! Too bad you had a hard time connecting with the character though. :( that's never fun. But as always, AWESOME review boo! I've been waiting around four years for some books and some of those still have no release date sadly Keionda. Seven years is ridiculous! It would have to be something really incredible for me to be interested in read seven years later. Wow, that's a committed reader right there. I haven't actually seen that Aentee, is it on Foxtel? This duology is cute, but book one Man Made Boy was just so incredibly lovely, you'll probably adore that one as much as I did. I have not read the first book, but that one sounds better than this one. Maybe the author threw in for "human" factors to give life to Boy? I have to read the first book for myself to see if I'd love it, too.